•Use alternatives to flammable, mold prone building technologies that are far stronger and more resilient. For example, ferrocememt roofs don’t blow off in a hurricane and don’t burn. •A love of designing and building unconventional architecture and of developing self reliant offgrid buildings, water catchment, materials development, love of working outdoors, an eye toward creating buildings as art & an interest in aquaponics. 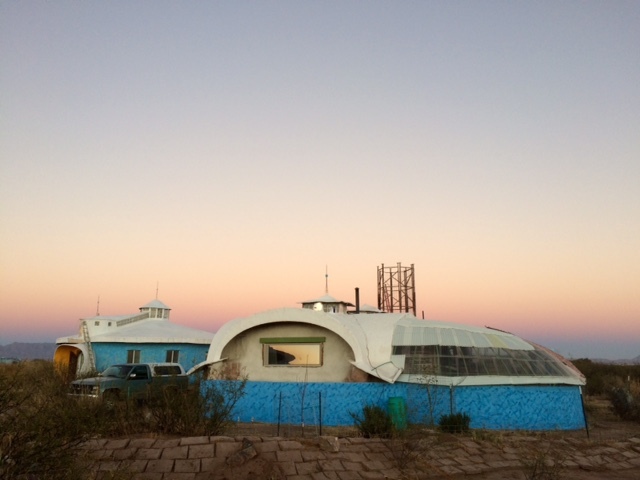 Above: view eastward at sunset at the ferrocement and earth bag dome home. 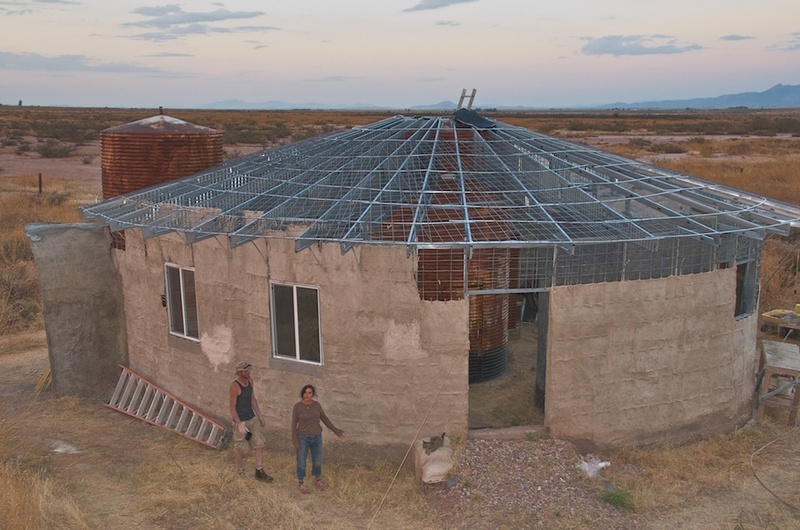 Round house, burlapcrete walls on a steel framed armature, and ferrocement roof. 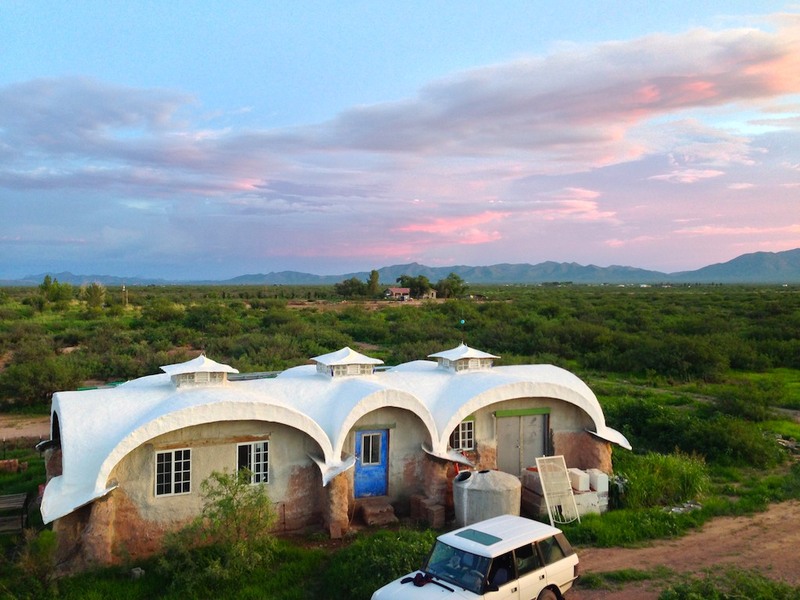 Round rooms made from repurposed 10,000 gallon water tanks. 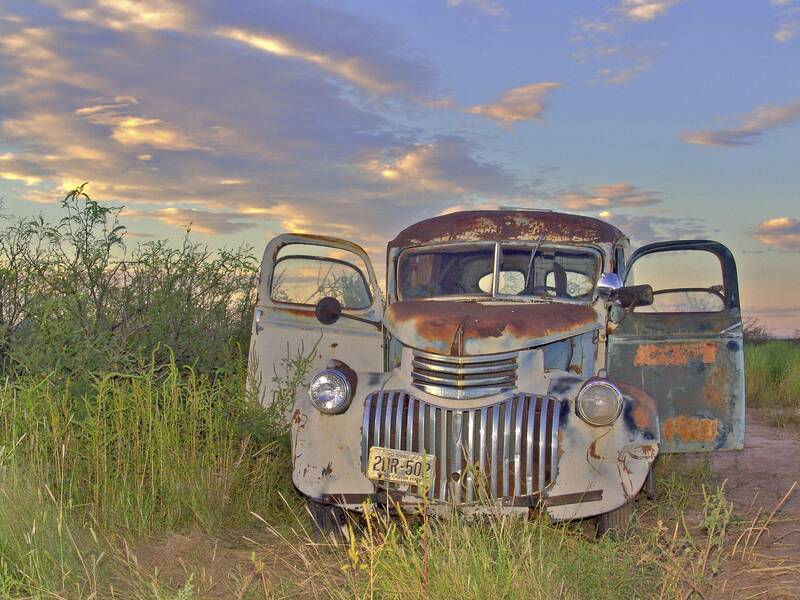 I moved to rural, southeastern Arizona largely because there was an alternative builder’s program through the planning and zoning department, which allowed me to try a variety of alternative construction projects on my property. Building to code specifications unfortunately does not erradicate burnable, mold prone structures that have roof designs that blow off and code allows building designs which routinely collapse or implode during tornados… Regardless of what’s causing increased severity of weather events, they certainly seem to be getting bigger and more frequent. Plus, many homes are insulated with things like rigid foam insulation, which when it burns, can off-gas cyanide, which has been linked to sudden cardiac arrest in first responders, and home owners as well as permanent neurological damage. I gained a somewhat cynical view of building codes, because they’re supposed to set the minimum allowable standards of safety and durability for construction, but the aforementioned examples of building to code demonstrate what I believe is a crisis of unsound premises. Homes that can easily catch fire, seriously mold if there’s a leak or flooding- these are things that should be avoided, especially now that we’ve seen what happens with hurricanes like Katrina, Sandy, and Harvey and Irma, plus the myriad fires and heat waves in the western states and Canada which are becoming the norm. Admittedly, my interest in alternative construction isn’t just about materials, but about architecture and building with an eye toward sculptural form. And then there’s the water catchment, attached greenhouse where an aquaponic garden is developing, a passive cooling tower currently at the framing stage, a rocket mass stove, and a move toward alternative power because it equates to self sufficient living instead of relying on someone else’s infrastructure to deliver goods and services. That’s the idea behind the garden too- if you have food, water, power, and have paid off the land and do your own building without taking out a construction loan, then you don’t have to rely as much on your finances, and you may gain insight that food is a more valuable and stabilizing currency than the dollar: you can’t eat money. There aren’t a lot of places in this country where you can buy land for less than a thousand dollars an acre, nor building methods that allow you to build cheaply enough to do it out-of-pocket, though due to the shallow depth of my pockets, I’ve had to build in piecemeal fashion. It’s turning into a Martian Camelot version of the Winchester mystery house- a seemingly never ending and ever artful endeavor that so far has taken ten years (sometimes as much as two years away for work). 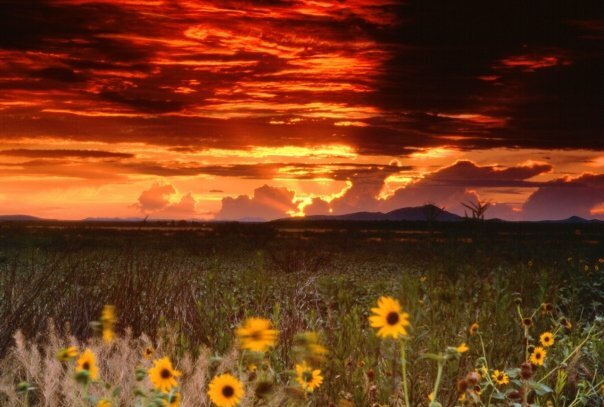 Cochise county, Arizona remains one of those places where you can buy land that cheaply. My first experience with alternative buildings was via my neighbor who built a strawbale house which burned to the ground inside of an hour. 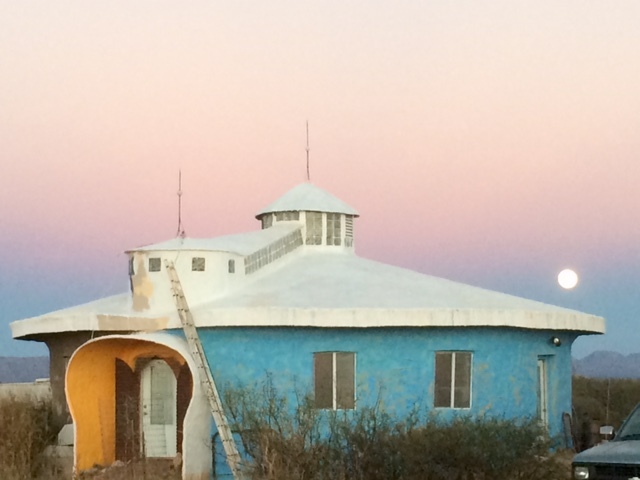 They had not yet coated the inside of the structure with stucco, and although numerous individuals and websites swear that well compacted straw simply doesn’t burn, my neighbor still lost her home and most every physical object she owned. Also, I’ve been to the Burning Man festival where they used straw bales to build a pyramid solely because they knew it would burn like an inferno guaranteed and leave no debris to clean up afterward, just drifting ash. Best case scenario, straw is compacted almost as densely as wood- which is flammable. In old construction, massive wooden beams often survive structure fires because the flames only char the exterior before the fire is extinguished, but even very thick logs burn fine in a fireplace given enough time. If there’s fuel to support a fire in the materials of which a home is built, that home and everything you own as well as your loved ones, are jeopardized. There is no fire district where I live, meaning no fire department will respond to a structure fire here- so I determined that building with anything that was even possibly able to burn down was simply not a rational option. Personally, I don’t think living in a timber frame house anywhere on the planet is such a great idea, especially now that most of the plywood sheathing is offgassing formaldehyde into the structures for years, and is ultimately a flammable box that can also be rendered uninhabitable by flooding. A wooden framed structure that gets soaked with standing water inside the walls begins to support mold and the whole building generally needs to be torn down- and sheetrock provides ample opportunity for mold growth, too. 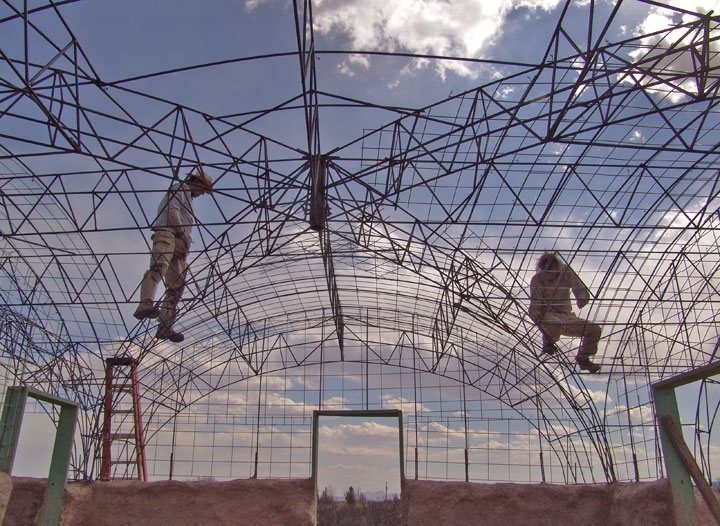 Other drawbacks so far as I was concerned regarding strawbale are that if they get wet during or after the construction process, they mold and make the structure uninhabitable. There’s a vacant strawbale house a few miles from where I live, because the bales got wet somewhere along the way and mold started growing in the walls. A less familiar scenario for strawbale destruction is if the stucco on the outside cracks and enough moisture builds up inside the wall, it tries to ferment and spontaneous combustion can take place- that happened over in California during the winter of 2005 because it was so unusually wet there. Take a flooding situation such as New Orleans and add strawbale construction, and you’d have walls fermenting and some ultimately burning unless the rot filled structures were bulldozed first. Also, rodents love the bales and any little crack or crevice can let them or insects in. Strawbale is alternative and neat looking and has great R value, but my experience with its flammability and rot issues ruled it out in terms of a viable alternative to wood frame construction. Here in the desert its K value (also known as the thermal flywheel effect, a property of thermal mass) that makes structures such as old adobe so much cooler than the surrounding desert without any air conditioning whatsoever except that drawn from the cool of the earth. One of the main drawbacks of building with adobe bricks or blocks, are that if they’re not reinforced, they can collapse on you during an earthquake- and they take a lot of sweat equity to make. We don’t get many earthquakes in SE Arizona, but we’re overdue out here and the last one destroyed local communities a hundred years ago. Sand bag walls flex with an earthquake without falling down, and give a lot of thermal mass for storing heat or cool without the need for heating or cooling with machines and fuel or electricity bills- and they don’t cost much. Sand bag wall systems have passed building codes in the California desert, for example. 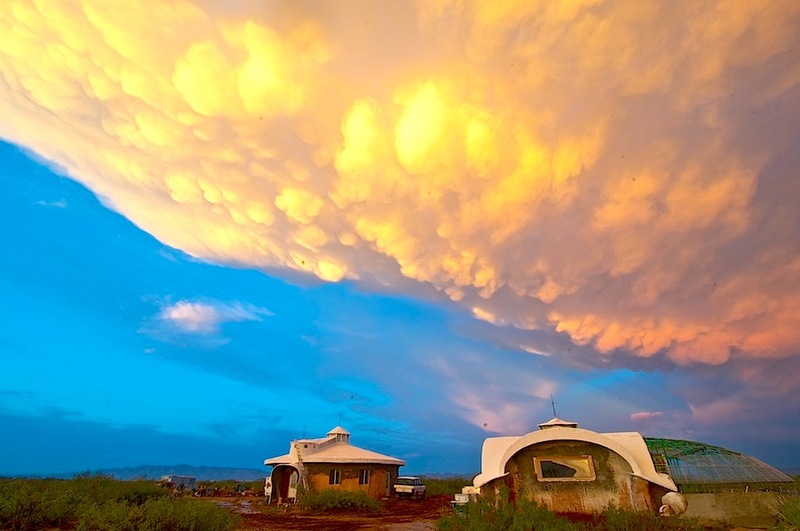 The ideal situation would be thermal mass with insulation on the outside, but not rigid foam as is used throughout the southwest- it creates a vapor barrier which is destructive to earth based structures such as adobe, rammed earth, cobb or earthbags. Its also a bad idea to use with a plywood skinned building for the same reason: a vapor barrier traps moisture by its very design, and trapped moisture behind the foam or tar paper, against the earth based or wooden walls leads ultimately to rot, which can damage the structure (even leading to structural failure in earth based wall construction), as well as give rise to mold and mildew which can drive people out of their homes. I’ve used type s lime in the adobe based rendering coat on the walls, as it is antibacterial and antimicrobial. Building codes that allow people to live in burnable, rot prone, poison offgassing boxes than can collapse on them in a quake or burn down around them, just don’t seem responsible / ethical / viable to me. Even if home owners escape unscathed, if the house burns they still won’t have a home or possessions, and these homes require lots of heating and cooling by design. Chris and Liz, who helped build the roofs while living on the property for several months. 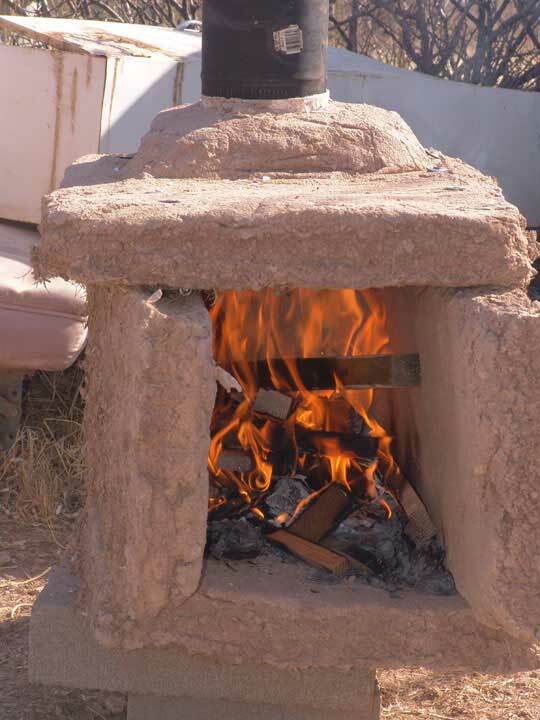 With my earthbag shop structure, I built a test oven out of the paper/adobe/lime material I used as stucco to coat the earth bags in the rest of the construction, to make sure it didn’t burn. I built a roaring fire inside the oven for an hour-and-a-half and the oven didn’t smolder, crack, or become charred. Even at its hottest, I could rest my hand on the stove very comfortably- this stuff adds a tremendous degree of fire rating, meaning it just doesn’t burn. The lime in it should inhibit any mold or bacteria from forming even if it stays wet for a long time as in the case of flood or unnoticed water damage. Another very cool feature of this stucco, is that holds screws and nails, and unlike cement or concrete it can take a sledge hammer blow and simply dent instead of shatter. I also have some issues with the beehive continuous earth bag construction method, as having earth overhead in the ceiling portion ultimately is likely to get wet and you won’t know it until its leaking through the inside walls, by which time much of the dirt will have gotten soggy and much much heavier. Having that overhead didn’t seem desirable so although I built earth bag walls on top of a footwall of gravel filled bags, my ceilings are ferrocement. Same is true on the burlapcrete structures I’ve built- ferrocement roofs. I realize in this country that buildings are considered as part of our throw-away culture, often built with what I view as shoddy materials and techniques so that they will need to be replaced like the particle board furniture and plastic car parts we’ve become accustomed to. In Europe, homes last generations upon generations. Here in order to bolster the economy after WW2 it was a government sponsored program of planned obsolesence for goods that has so permeated our culture, that we accept it blindly along with building codes that supposedly keep us safe, but in fact prescribe rotting, burning boxes that offgass deadly fumes during combustion. I live in one of the few areas that doesn’t require building codes, (there’s an opt-out program for alternative builders here), which means its one of the few places in America that allows people to make the choice to NOT live in homes designed to disastrous standards. And lastly, this rural bit of nowhere has amazing beauty, vast horizons which my Montana friend says is the real big sky country. You are ABSOLUTELY my hero!!! Can you please be so kind and get in touch with me? I’d love to ask you a couple of questions . . . and I realize that your time is precious. I get it, believe-you-me! Thank you so very much! Your work is incredible and inspiring! I’m going to use all the helpful bits here and appreciate the lovely pics also. I’m getting back to the planning for my off grid land, and I’m brushing up on my design-for-fire tools. I’ve seen lately that in Australia many rural homes have large amounts of water storage (concrete or steel, as plastic melts), sprinkler systems on the roofs and walls, a pump and back up power to run it in case of a fire. Then the owners can focus on getting out instead of hosing down their roofs- and with the kind of fires we’re seeing, that hose water would evaporate away. 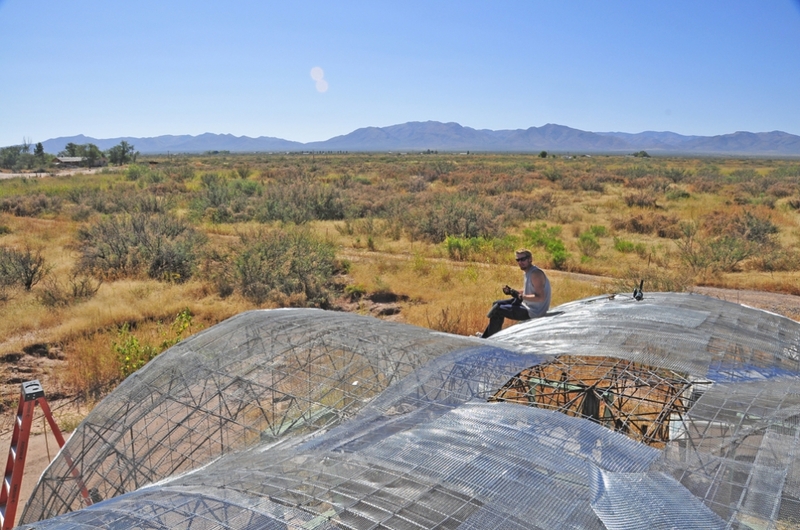 I’ve got a large greenhouse, thinking of using that solution. Just found your sight. One question I have with ferro cement. Is there a problem with moisture corroding the embedded iron. i.e. the “ferro” part? That has always been an issue in concrete work. If it ever fails that is usually why. I use anti-hydro which is an additive that makes cement and concrete waterproof, and incidentally is food grade, making it ideal for building ferrocement water storage. There is a corrosive element to the anti hydro but it shouldn’t be long lived after curing, and if it’s waterproof then there’s no moisture soaking into the cement (normally Portland cement absorbs water which is why water that’s infiltrated the ‘hard sponge’ which is Portland cement, can crack the cement if it freezes. That’s also the deal with deeper foundations respective to winter temperatures. There is such a thing as basalt rebar but I use standard rebar which I paint with rustoleum and then galvanized cattle panels with wire lath (sharp) attached with a hog ring gun from one side, and the other using galvanized 1/2” opening hardware cloth because it is much easier to apply cement through the hardware cloth and avoid voids. The wire lath has small enough holes as to retain cement work, such as the underside of roofs. Thank you for the informative reply. I will look into using the waterproofing for my tanks. I plan on several over time for my 26 acre off grid homestead. I will also see about it for my aircrete dome buildings. I will look over your sight also as I find the time. I recently purchased an aircrete foam generator and did some experimentation but I think my well water is too hard- foam correct weight but collapses to about half volume. 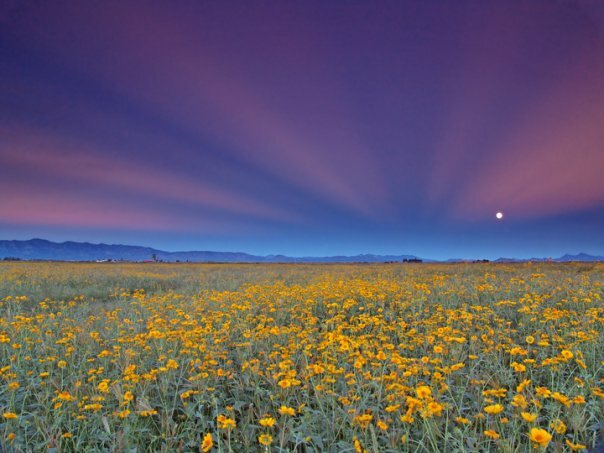 Or it may be that it was just too cold- days in the 60’s but nights that dipped into the 20’s here at a mile high. My desire is to add an aircrete layer externally, including roof decks. But I may have to wait until spring.